Published in TomDispatch, Mother Jones, and The Nation. 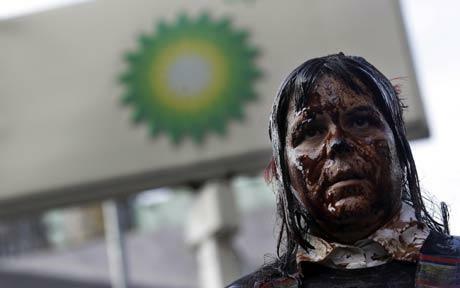 This might be an opportune time to make a disclosure: I am a BP shareholder. Admittedly, I am not one to throw my weight around at the company’s annual meeting. In fact, I have never attended an annual meeting, and if I did I would have very little weight to speak of. I own two shares of BP stock. I received my stake in the company as a Christmas gift in 1989, when I was 14 years old. The previous June, I had taken a “summer enrichment” course in the Des Moines public schools, designed as an introduction to the world of business. The teacher gave each of us in the class a modest hypothetical budget to invest in the stock market. Earnest young capitalists, we made our picks and then followed the quotes in the morning paper. I invested heavily in Amoco and finished the summer feeling that my portfolio had done quite well. As a result, my younger brother decided that I should receive a real piece of the enterprise that was once John D. Rockefeller’s Standard Oil. He conspired with my mom to get me an Amoco share for the holidays. The merger proved profitable indeed. Over time, the price of my stock nearly doubled. I received dividends every three months, usually of around 60 cents per share. And by the mid-2000s, BP was making some $20 billion per year in profits. The numbers looked good. Of course, these are not the only numbers to consider. In fact, in the wake of BP’s disaster in the Gulf of Mexico, they don’t seem like the right numbers at all. It’s time for a different accounting: What has that catastrophic spill cost our society? What price do we pay for our dependence on oil? How do we measure these things? When I first began receiving Amoco’s annual reports, they featured photos that celebrated robust industrial capabilities; I recall multicolored sunsets behind fields of horsehead oil pumps in Texas. These days, there’s still some of that, but the reports tend to have more shots of solar panels, white windmills, and smiling school children (our future). Someone looking at the annual review the company sent me in 2001, for instance, might have been fooled by the photos of lush, palm-heavy landscapes in Indonesia, California, and Trinidad into thinking that it was a mailing from Conservation International. Such changes in public relations were born of tragedy. Back in 1989, not three months before my summer business class, the Exxon Valdez collided with the Bligh reef in Alaska’s Prince William Sound, breaching its hull. Even according to conservative estimates, it spilled more than 10 million gallons of oil and contaminated more than 1,200 miles of ecologically sensitive coastline. For years afterwards, we saw Exxon deal with the fallout of the catastrophe. However many thousands of boats and booms the company deployed, it only managed to recover about 8% of the oil released. The rest evaporated, coated beaches, or sank to the bottom of the sea. The Exxon Valdez Oil Spill Trustee Council estimates that 250,000 seabirds, 2,800 sea otters, 300 harbor seals, 250 bald eagles, up to 22 killer whales, and billions of salmon and herring eggs were killed by the spill. Two decades later, some 16,000 gallons of leftover oil still poison wildlife in the Prince William Sound. The cost to the planet was steep. The cost to Exxon could have been severe as well. While the company claims that it spent $2.1 billion on its clean-up efforts, it might have had to pay many times that in fines and lawsuit settlements. The government initially threatened $5 billion in criminal penalties, and in 1994 a federal jury ordered the company to pay $5.2 billion in punitive damages to Alaskans who had filed a class-action lawsuit. For a time, things at Exxon looked grim. Although these were the worries of a rival corporation, Amoco investors did get a taste of what Exxon was experiencing. In 1990, after a dozen years of litigation, a federal judge in Chicago ordered my company to pay $132 million in damages to the French government and other parties. They had all been harmed 12 years earlier when the Amoco Cadiz ran aground off the coast of Brittany, releasing 68 million gallons of oil. At the time, it was the largest tanker spill ever. It killed millions of sea urchins and mollusks, thousands of tons of oysters, and almost 20,000 birds. It was a prescient concern, especially given the resolution of the class-action suit. In that arena, Exxon’s lawyers proved patient and skilled. They held up the case in court for years until, in 2008, nearly two decades after the spill, the Supreme Court ruled that damages paid by the company would be limited to an exceptionally absorbable $507.5 million. In the months during which the well under BP’s Deepwater Horizon freely spewed crude into the Gulf of Mexico, it released 4.9 million barrels of oil, or 205.8 million gallons, according to a government panel tasked with measuring the spill. Depending on what estimates you use for the earlier disaster, this amounts to roughly 20 times as much oil as the Exxon Valdez released. In negotiations with the Obama administration, BP agreed to put $20 billion into a fund for cleanup. It has also indicated that it will pay “all legitimate claims” related to the disaster. Despite such vows, how much of the final cost BP will actually end up paying is unclear. Spill-related damages and lost economic activity could amount to tens of billions of dollars more than what BP is currently setting aside. An Oxford Economics study predicts that costs to the tourism industry alone could exceed $22 billion. Damage to the natural environment, much of it potentially unseen, is almost impossible to quantify. In the case of the Valdez spill, according to the Associated Press, “the state priced each seagull at $167, eagles at $22,000, harbor seals at $700, and killer whales at $300,000.” Such an effort could be replicated for the Gulf. Yet a price tag of $167 per seagull seems tragically inadequate as a means of accounting for a destroyed population of birds, and it doesn’t begin to account for species that may seem less significant to us, but could be crucial to the ecosystem. Now-deposed BP executive Tony Hayward repeatedly vowed to Gulf residents that the company would “make this right.” Likewise, in 1989, after the Valdez ran aground, Don Cornett, Exxon’s top official in Alaska, told locals dependent on the ruined fishing industry, “We will do whatever it takes to keep you whole. We do business straight.” Of course, that was before Exxon went on to pursue years of dogged litigation to limit its liability. Aspects of this situation are reminiscent of the aftermath of another recent “spill.” They recall the way in which bailout banks like Goldman Sachs and JPMorgan Chase relied on billions of dollars in public funding to stay afloat after causing a global economic near-collapse, then turned around the next year to report massive profits and once again award exorbitant bonuses to their well-heeled employees. In each case, there is something deeply unsatisfying about how the market handles the destructive behavior of powerful economic actors. It is not a new idea to suggest that the true costs inherent in many economic pursuits have been unfairly socialized. Nor does this notion apply only in moments of crisis. Economists give the name “externalities” to costs associated with a business that are not reflected on the balance sheet of that enterprise or in the prices of its products, but rather are borne by society at large. For example, if a factory can dump its waste in a local river and is never fined, it has successfully externalized the cost of waste disposal, which the public pays for in the form of polluted water and its consequences. Oil has many externalities, and the BP disaster has been only the most recent trigger — “the reminder we didn’t need,” as Carter Dougherty at BNet put it — for refreshed awareness that the gas we buy is far more expensive to our country than what any of us pay at the pump. In August 1987, the New York Times published an editorial with the bold title, “The Real Cost of Gas: $5 a Gallon.” Given that, at the time, you could commonly fill up for 99 cents per gallon, and that even the energy crises of the 1970s did not push gas prices above $1.50 per gallon, $5-a-gallon gas was pretty much unimaginable. Yet the Times editorial stated that, “in light of the administration’s willingness to risk lives and dollars in the defense of oil from the Persian Gulf… the real cost of oil should include the cost of the military forces protecting supplies.” It argued for an energy policy that accounted for Pentagon expenditures. Two Gulf wars later, an array of reports from both liberal and conservative sources suggest that $5 per gallon is anything but an outlandish estimate for the true cost of gas. It could, in fact, be far too low. Taking military spending into account would only be a start toward reckoning with what we really pay for oil. But since the military takes up a massive part of our national budget, it would be a good start. Anita Dancs, an economist with the Center for Popular Economics, notes that “energy security, according to national security documents, is a vital national interest and has been incorporated into military objectives and strategies for more than half a century.” After breaking down the overall military budget and evaluating specific missions, she concludes that “we will pay $90 billion this year to secure oil. If spending on the Iraq War is included, the total rises to $166 billion.” That would already add 56 cents to every gallon of gas we buy. The late Milton Copulos was a veteran of the Heritage Foundation, an advisor to both President Ronald Reagan’s White House and the CIA, as well as the head of the right-wing National Defense Council Foundation. He was particularly concerned with dependence on foreign oil, and he highlighted how oil imports were both an economic boon to unsavory governments abroad and a missed opportunity for domestic investment. In 2006, Copulos argued that, if you add to oil-related defense spending such factors as the economic impact of periodic oil supply disruptions and the opportunity costs of money spent on oil imports that might have been used elsewhere in the economy, the “hidden” costs of the U.S. dependence on petroleum would total up to $825 billion per year. “To put the figure in further perspective,” he wrote, “it is equivalent to adding $8.35 to the price of a gallon of gasoline refined from Persian Gulf oil.” At today’s rates, that would hike the price at the pump to approximately $11 per gallon, or more than $250 to fill the tank of a typical SUV. Military spending is just one type of public subsidy that benefits the oil industry and keeps the price at gas stations artificially low. When I made my adolescent wager on Amoco, I was not aware that the company also profited from massive tax breaks and other non-military forms of support. Yet these go a long way toward making the enterprise a safe bet for investors. Copulos factored some of them into his $11 per gallon calculation; others would drive the price still higher. The Times story notes that BP was, for instance, able to write off 70% of what it was paying in rent for the Deepwater Horizon rig that caught fire, “a deduction of more than $225,000 a day since the lease began.” Amazingly, BP is also claiming a $9.9 billion tax credit for its response to its oil spill in the Gulf of Mexico. Not only does our government allow energy companies to avoid taxes in myriad ways, the variety of public supports for the oil industry outside the tax code are almost too numerous to list. A 1995 report by the Union of Concerned Scientists mentioned several, including these: the government invests in substantial energy research that directly benefits the oil industry; it spends millions to maintain a Strategic Petroleum Reserve, designed to help stabilize the oil supply; and it maintains a massive highway system that facilitates gas-intensive auto travel, only part of which is paid for by taxes on motorists. Then, of course, there is the environmental price we pay, most notably in the form of global warming. As Ezra Klein wrote recently in Newsweek, some experts argue that carbon emissions from cars could be offset at the cost of about 65 cents per gallon (money that would presumably be invested in activities like reforestation). Others believe the cost would be much steeper — perhaps steep enough to turn oil industry profits into losses. Andrew Simms of the British New Economics Foundation calculated that, if you were to combine BP’s exploration, extraction, and production activities with those involved in the sale of its products, you would end up with 1,458 million tons of CO2-equivalent entering the atmosphere per year. Pricing the cost of carbon emissions at $35 per ton, he puts the bill for climate-change damages at $51 billion. Since BP reported a mere $19 billion in profits in 2006, the year Simms was reviewing, he argues that it would have been “$31 billion in the red,” or effectively bankrupt, if it had to cover the climate-change bill. There’s more, too. Consider that car exhaust and oil industry pollution mean an increase in smog and asthma, burdening our health-care system. Then count in the damage caused by massive oil spills we seldom hear about in places like Nigeria, Ecuador, or China, as well as the economic cost of traffic congestion and excess auto accidents made possible by subsidized car travel (costs which the willfully contrarian Freakonomics blog contends may be even more expensive than global warming). The final tally is staggering. High-end estimates of the true costs of the gas we use come to over $15 per gallon. Taxpayers subsidize significant parts of this sum without even knowing it. Unfortunately, this is almost certainly an overstatement. If the exploits of oil companies were made more costly, these companies would simply raise their prices and pass along the costs to consumers. And we would pay them because we are unwilling to give up the speed and convenience of driving, or the luxury of airline travel. We would pay them because we are unwilling to reduce our consumption of foods shipped to our grocery stores from far away, or diminish our energy consumption in many other ways. We would pay them in order to maintain at least a facsimile of our previous lives. While it is too much to say that “most of the world’s oil” would be abandoned, some might be. In 2008, when gas prices soared above $4 per gallon, Americans did behave differently. As the New York Times reported, we drove 10 billion fewer miles per month than the year before; surprising numbers of SUV owners traded in their vehicles for smaller, more efficient cars; and daily oil consumption was lowered by 900,000 barrels. Investors began to reconsider how “realistic” the costs of developing alternative energies might be and to fund them more seriously. In other words, Americans responded to the market. Some things cannot be — or should not be — left to business spreadsheets. Calculating the cost of a destroyed ecosystem in the Gulf of Mexico or along the coast of Alaska means putting a price tag on things that are not meant to be priced. If you accept that a harbor seal’s life is indeed worth $700, and a killer whale’s $300,000, pretty soon you must accept that your own life has a price tag on it as well. Yet taking the limits of economic calculus seriously has implications. It means that we cannot trust the market to solve its own problems — to self-regulate and self-correct. It means that we need democratic action to place controls on corporate behavior. It means that some things must be considered not merely expensive but sacred, and defended against forces blind to their true value. Those who believe that the price of my BP stock will recover in the next year might be wrong. Even if the stock bottoms out, however, that won’t restore a shattered Gulf, nor will it change a system that prizes easy consumption and deferred responsibility. We can only correct for the catastrophe oil has wrought by living according to a different measure. Research assistance for this article provided by Tim LaRocco and Arthur Phillips.